As you may have noticed it has been a few days since the last post. The reason being that once you get into London there is so much to do and see that most other things get ignored. Every time you turn a corner a new building or monument is there that you have to stop and admire. We started with the world famous Westminster Abbey (home to remains of Isaac Newton and Charles Darwin, among many others.) I am trying not to take the Lord's name in vain in attempting to describe it. The painstaking craftsmanship put into all of the sculptures and architecture is amazing. They told us that no pictures were allowed, but being the good Seifert that I am I may have taken a couple while security wasn't looking. We decided to walk through central London after that and ended up in Trafalgar square. Now I am going to give you a little world news. London had a protest over Libya and Government spending and some of the protesters decided to get creative. We walked along the south bank of the Thames river taking in sights on our way to the Tate Modern Art Museum. I can usually get behind most art, but modern art still escapes me. That being said i have to give it to the artists that thought of something that....interesting. Millions of individually hand painted porcelain sunflower seeds. Later on we met up with a friend of Dave's from school named Sebastian. 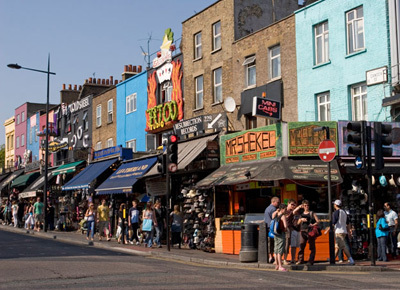 He's currently studying in London and showed us around his favorite part of town - Camden Town. It's a semi-hidden marketplace that sells anything and everything imaginable. The best way I can describe it is if a whole load of hippies embraced capitalism. We left for Bath yesterday and will be returning to London soon. The bus here was amazing. We got to stretch out and lean back. Not quite the case of the 9 hour bus ride to London from Edinburgh. Take a look of what was going on for about 4hrs straight below. WARNING: it is a bunch of drunk Scottish guys cursing like sailors.